Super silent design minimum the noise to 35dB±10%. ELUTENG Dual USB Cooling Fans. Build-in high quality motor and dual ball bearings have a lifespan of 45,000 hours and allows the fans to be laid flat or stand upright. This is not a cheap PC type fan worth about 50p with the noise level of a vacuum cleaner - this is a proper low noise brushless fan of very good quality. 24V DC Nominal. 80 x 80 x 25mm WDH. 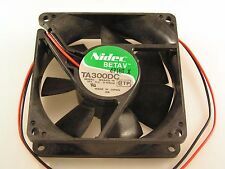 Nidec BETA V TA300DC M33412-16 12V DC Fan 0.15A. Fan has 2-wires (black, red) Bare wires. Fan Speed 2400 rpm. Colour of product: Black, Cable length: 0.4 m. Rated current: 0.16 A. Width: 80 mm, Depth: 25 mm, Height: 80 mm. The PWM function allows the motherboard to run the fan precisely at its necessary speed. For performance and quiet. The distinctive amber colour rotor blades are designed with low air impedance, which gives the ultra quiet acoustic experience. Twin ball bearing gives consistent performance and long life. ASUS Socket 775 Motherboard P5KPL-AM SE REV. 2.01G. AOpen Socket 478 MicroATX Motherboard MX46-533V. Kyocera FS-3040MFP Multifunction Laser Printer 90% Toner FS-3040MFP . Job Lot of 50 x 80GB 3.5" IDE Hard Drives. AcoustiFan™ DustPROOF - Premium Quality Quiet 80mm Multi-Purpose Cooling Fan. The AcoustiFan™ DustPROOF series use the highest quality double-ball bearings available for reliability, use-anywhere inside a PC for extra long life expectancy (upgrade your PC and take these fans with you!). Improve the airflow in your case with an Ultra quiet 80mm Paxfan with 3-pin connector and twin ball bearing to give a consistent long life performance. Ultra quiet 8cm black case fan. Bearing type Twin Ball Bearing. Fan Bearing Sleeve bearing. Product Type Case fan. Fan Height 25.4 mm. Rotation Speed 2600 rpm. In the unlikely event there is a problem with your item we are always happy to investigate and resolve issues. Bankers Draft. Credit or Debit Cards. However, if you opt for the white connector (minimum fan speed), be certain to design the airflow through your PC system carefully and monitor system and component temperatures. Acousti have even included four handy cable ties with each DustPROOF™ fan! Cable Leads AWG 22, TR 64, stripped and tin-plated. Service life L10 at 40 °C 80000 h. Sound pressure level dB(A) 24. Speed (rpm) min-1 2000. Direction of rotation Clockwise, viewed toward rotor. Type 8312 L.
Connectors: 3-pin TX3. Product Type: Cooling Fan. Fan Speed (rpm): 2500 rpm. Fan Information. 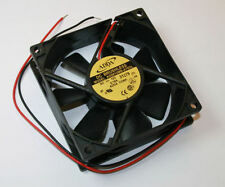 Fan Height: 80 mm. Fan Depth: 25 mm. Fan Width: 80 mm. Material: Plastic Fan Enclosure. Model number: SP802512M. Sold by boxes of 100Pcs. Ball bearing fan. Bi-Sonic 12v Fan fan. Box size: 48x36x20cm. Rated Current: 0.16A. Size: 80x80x25mm. 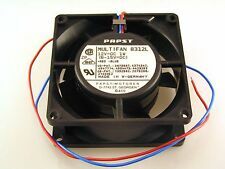 Hi-Grade D21 CPU Cooling Fan. Item has been pulled from salvage machine so expect the item to be in a used condition with minor scuffs etc. There are only 4 MARs in the United Kingdom. Condition: Used - Full working order. Cooler Master Desktop Cooling Case Fan. Fan Size: 80 x 80 x 25mm. DC 12V 0.15A. 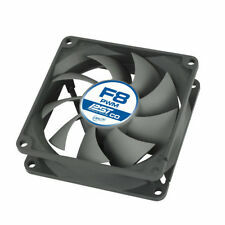 24V 80mm fan made by NMB Minebea size 80mm x 80mm x 25mm. ASUS Socket 775 Motherboard P5KPL-AM SE REV. 2.01G. Kyocera FS-3040MFP Multifunction Laser Printer 90% Toner FS-3040MFP . AOpen Socket 478 MicroATX Motherboard MX46-533V. Job Lot of 50 x 80GB 3.5" IDE Hard Drives. Connectors: 4-pin (PWM Power), 3-pin (speed transmission to the motherboard), 4-pin (for the second fan). During that process you will be issued with an RMA number. 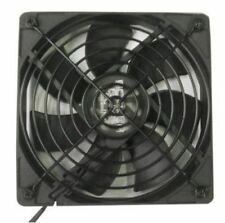 AcoustiFan DustPROOF - Premium Quality Quiet 80mm Multi-Purpose Cooling Fan. The AcoustiFan DustPROOF series use the highest quality double-ball bearings available for reliability; use-anywhere inside a PC for extra long life expectancy (upgrade your PC and take these fans with you!). FAN 80mm 12VDC. Panasonic TV Type TX-PF42G30. Three wire, (red blue and yellow – yellow is a sense wire to detect if the fan is running, – it can be ignored if you want, fan runs happily if blue and red only connected). Connector 1 x LP4 (Male), 1 x LP4 (Female). It can be used to circulate cool air into the case or exhaust warm air out, preventing problems due to overheating components. A quiet running brushless ball bearing DC motor coupled with a high efficiency blade design is capable of moving 37 CFM (cubic feet per minute) of air. 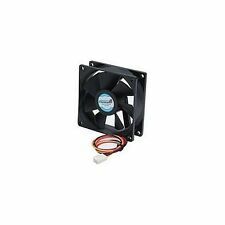 Y.S.Tech Cooling Fan 80mm x 25mm. Item has been pulled from salvage machine so expect the item to be in a used condition with minor scuffs etc. Helpful Links. There are only 4 MARs in the United Kingdom. 8cm 80mm x 25mm GDT 2pin DC 12V PC CPU Case Cooling Cooler Fan Heatsink. Big are flow and ball bearing type. Bearing Type Ball. neutral or. Rate (item arrived). Ball bearing. 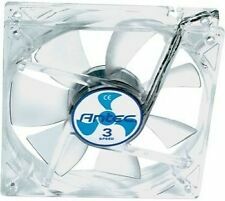 Second fan for PC case. If found to be faulty, we will replace like for like. IF YOUR NOT HAPPY THEN WE WILL RESOLVE IT. 2 In 1: 2 fan connect to one USB interface, plug into 1 USB port, 2 fan cooling. 1 Dual 120mm USB Fan. USB cable length: 55cm(×2). Size: 12 12 2.5cm(×2). Noise: 35db±10%. Airflow : 56CFM (×2). Rotation speed : 2700RPM(×2). Model: FD08025B1LC. F.T.C. 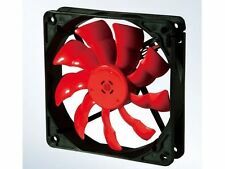 3Pin Case Fan 80mm x 25mm. Item has been pulled from salvage machine so expect the item to be in a used condition with minor scuffs etc. There are only 4 MARs in the United Kingdom. ASUS Socket 775 Motherboard P5KPL-AM SE REV. 2.01G. AOpen Socket 478 MicroATX Motherboard MX46-533V. Kyocera FS-3040MFP Multifunction Laser Printer 90% Toner FS-3040MFP . Photo is a representation only and may not be of actual item. P/N: R128018DL. 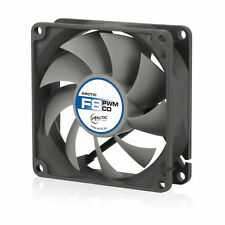 Everflow Cooling Fan 80mm x 18mm. Item has been pulled from salvage machine so expect the item to be in a used condition with minor scuffs etc. Helpful Links. There are only 4 MARs in the United Kingdom. 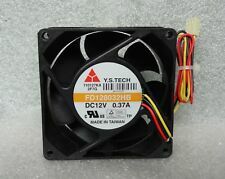 80mm 38mm 8cm New Case Fan 24V DC Ball Brg 4Wire PC Computer Cooling. Big are flow and ball bearing type. Bearing Type Ball. neutral or. Rate (item arrived). Other Countries. 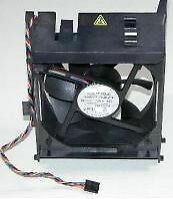 An 80mm by 35mm three blade case fan sol as shown in the image. ASUS Socket 775 Motherboard P5KPL-AM SE REV. 2.01G. AOpen Socket 478 MicroATX Motherboard MX46-533V. Photo is a representation only and may not be of actual item. (AC 110V 120V 220V 240V Ball Bearing 80x80x25mm PC Brushless Computer Case Cooling Fan. Item included: 1 x cooling fan. 5) It is best choice for your product cooling. 4) Easy installation. 3) Perfect match for the original one. 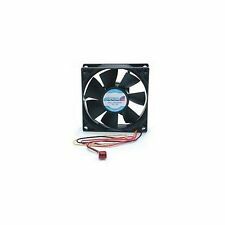 Sunon 3Pin Case Cooling Fan 90mm x 25mm. Item has been pulled from salvage machine so expect the item to be in a used condition with minor scuffs etc. There are only 4 MARs in the United Kingdom.